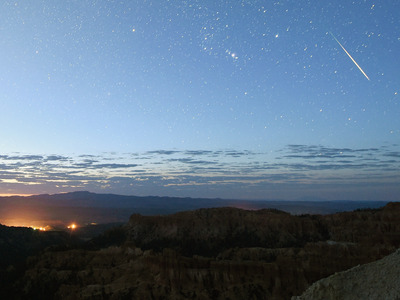 Ethan Miller/Getty ImageThe Perseid meteor shower peaks in mid-August. Every year, the Perseids meteor shower peaks in mid-August. The Perseids are known both for their epic “fireballs” – explosions of light and colour that last longer than those from typical meteors– and for their long, streaking tails. This year, the show will be particularly great, since there’s a new moon August 11, meaning there’ll be practically no moonlight to interfere with the show. The best time to watch will be on the night of August 12 and the early morning of August 13, especially in the pre-dawn hours. The Perseidsmeteor shower is often considered the most spectacular of the year, and this summer’s show should be particularly excellent because of the phase of the moon. Every year, the Perseids light up the skies when Earth passes through the debris tail of the Swift-Tuttle comet, which travels a 133-year-orbit of the sun. Tiny bits from the comet slam into our atmosphere, burning up in fiery, colourful streaks, as NASA explains. The Perseids are known both for their epic “fireballs” – explosions of light and colour that last longer than those from typical meteors – and for the long, streaking trails they leave behind. This year’s shower lasts from July 14 to August 24, but it reaches its peak from 4 p.m. ET on August 12 through 4 a.m. ET on August 13, according to NASA JPL. Because the moon enters a new phase on August 11, moonlight won’t interfere with the celestial display. That means the meteors’ fireballs and tails should look spectacular on a practically moonless night. The Perseids are named after the constellation Perseus, which is where the meteor shower’s colourful streaks appear to come from in the night sky. But you don’t have to look that direction to see the show – the meteors can appear anywhere in the sky overhead. Depending on when you decide to watch, you’ll have a chance to see something different. In the evening, starting around 10 p.m., you’ll see fewer meteors, but those that do appear will be longer-lasting and tend to have longer tails. The best time to see the most meteors according to the American Meteor Society tends to be just before dawn, around 4 a.m. local time. If you happen to have trouble sleeping on Sunday night (August 12), that’s a perfect time to step outside. During the peak, it’s possible to count 50 to 100 meteors per hour. But even if you can’t step outside a couple hours before the sun comes up, it’s worth checking the sky in the late evening and early morning. The days around the peak, especially August 11 and 13, also tend to have good viewing. Since the Perseids always show up in August, they often coincide with warm summer nights – perfect weather for viewing if you can avoid rain or clouds and get to a dark spot. Enjoy the show.